Synopsis: With the Earth on the brink of recolonisation by dragons, David Rain is sent on an important mission: to seek out and destroy a trace of dark fire, the deadliest force in the universe. But with success could come a terrible price, the sacrifice of a beloved clay dragon. How much does the life of one small dragon count, when the alternative is the birth of a darkling...? Two days have passed since David last appeared to Zanna and Alexa in the park. Those two days have filled Zanna with a confusion and hatred. Where was he? How did he survive? Who is he? What she does not know, is that David has been entrusted with a mission; a mission that will decide the fate of the universe. He must destroy all traces of the dark fire. But the question is, how much is he willing to risk? As with the previous books in the Last Dragon Chroncies, Chris d’Lacey has re-thought the concept of dragons. His vision on ‘how the earth would be like if dragons existed’ have a realism about them that many fantasy novels don’t. His unique ideas about dragons set them to life in a way that is believable, and yet awe-inspiring. 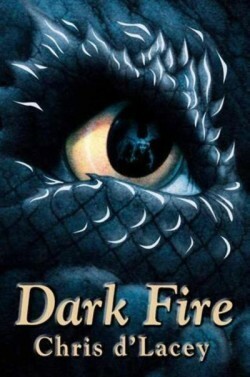 Dark Fire is a much darker book than any of the previous, and I think where as the first novel was a very loveable but tame novel, this book will appealm to a much larger audience. Even the cover feels much more dark and sinister. Previous books have really changed what we think of David as a character, and at last, we find out what is really up with him! Again, with Alexa, we didn’t know what was going to happen with her. Dark Fire has revealed who she is a what she is…I need to applaud Chris d’Lacey again, for his very believable characters. All of them are 3-dimensional, and are great to read about!